It seems like the whole world is gearing up for the eighth and final season of Game of Thrones, the fantasy series that returns to HBO on April 14. 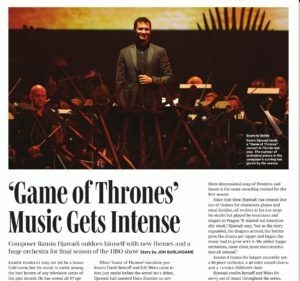 In anticipation of this, I interviewed Ramin Djawadi — who won his first Emmy last year for his music for the final episode of the seventh season — about his history with the show. For this Variety story, he talks briefly (without spoilers) about working on the final season, about what the journey has been like (including a world tour with live orchestras playing the music) and what his top five musical moments in the series have been. Game of Thrones, you’ll not be surprised to learn, has changed his life. 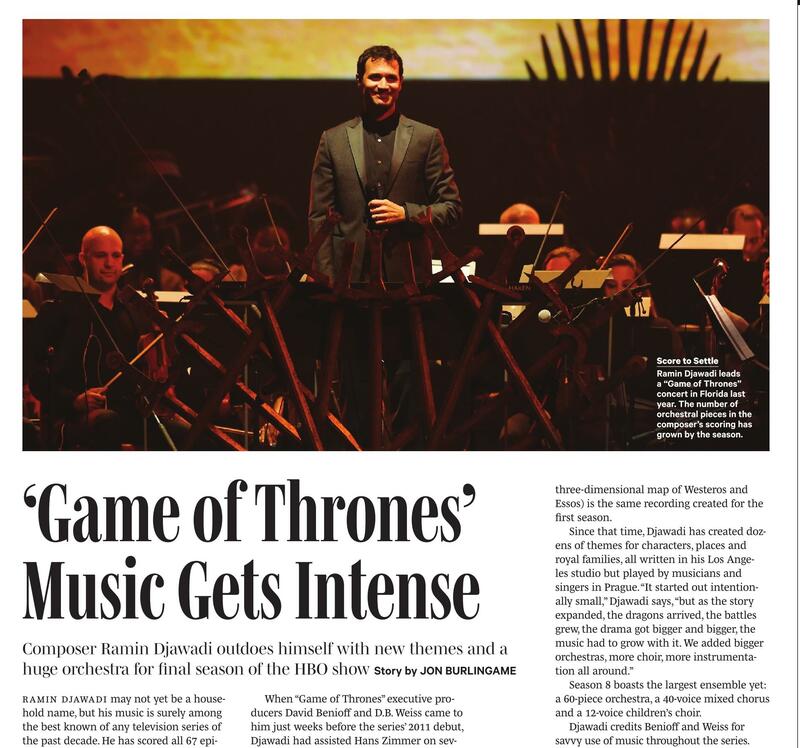 This entry was posted in Composers, Interviews, Television Music and tagged Game of Thrones, music in Game of Thrones, Ramin Djawadi, Variety on April 4, 2019 by Jon Burlingame. 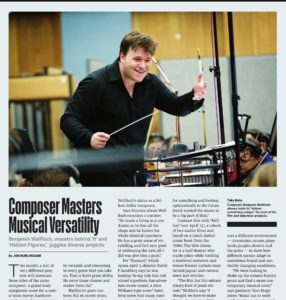 Composer Benjamin Wallfisch — recently Grammy-nominated for his contributions to the Hidden Figures and Blade Runner 2049 soundtracks — has no fewer than three major projects being released in April: feature film scores for Shazam! 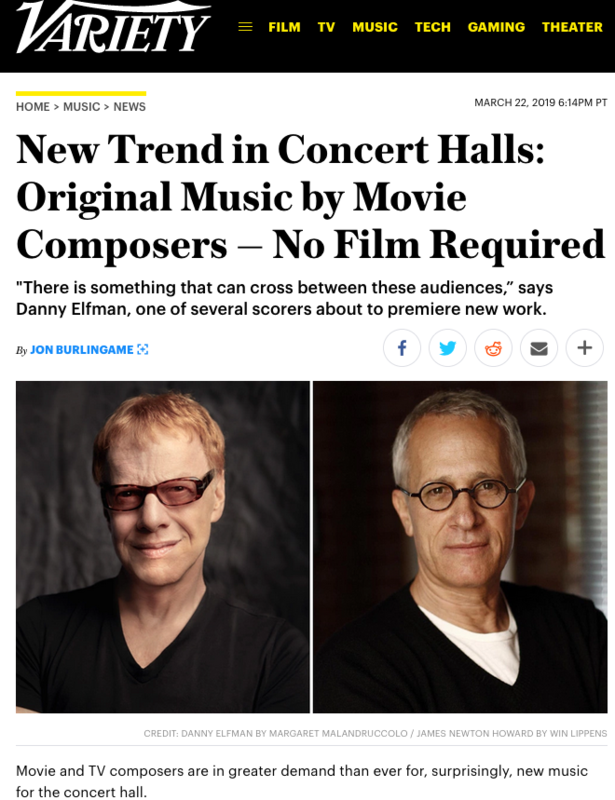 (a big symphonic approach for the comic-book adaptation), Hellboy (a punk-infused score for the reboot) and Hostile Planet (a six-hour nature documentary for National Geographic). London-born, thoroughly trained in the classical world but relatively new on the Hollywood scene, he talks about his life and recent career in this story for Variety. 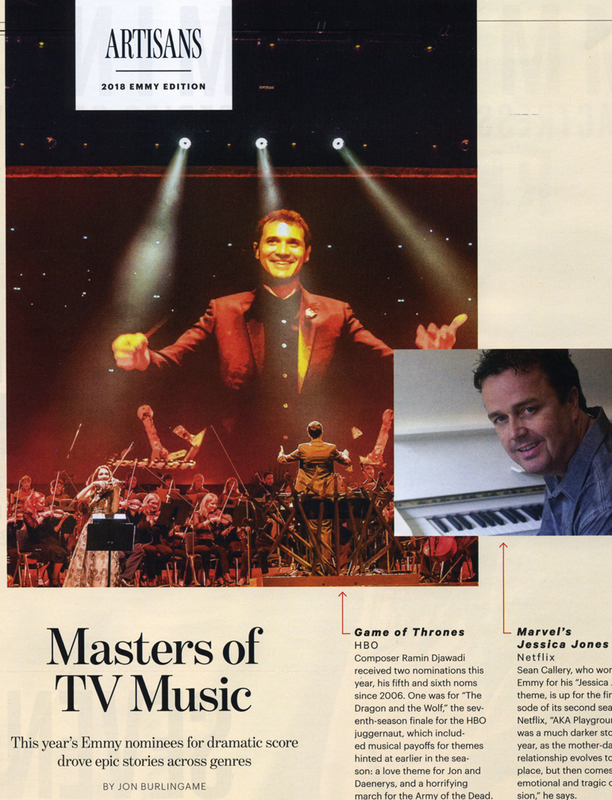 And Hans Zimmer talks about their collaborations in this second story from the same issue. 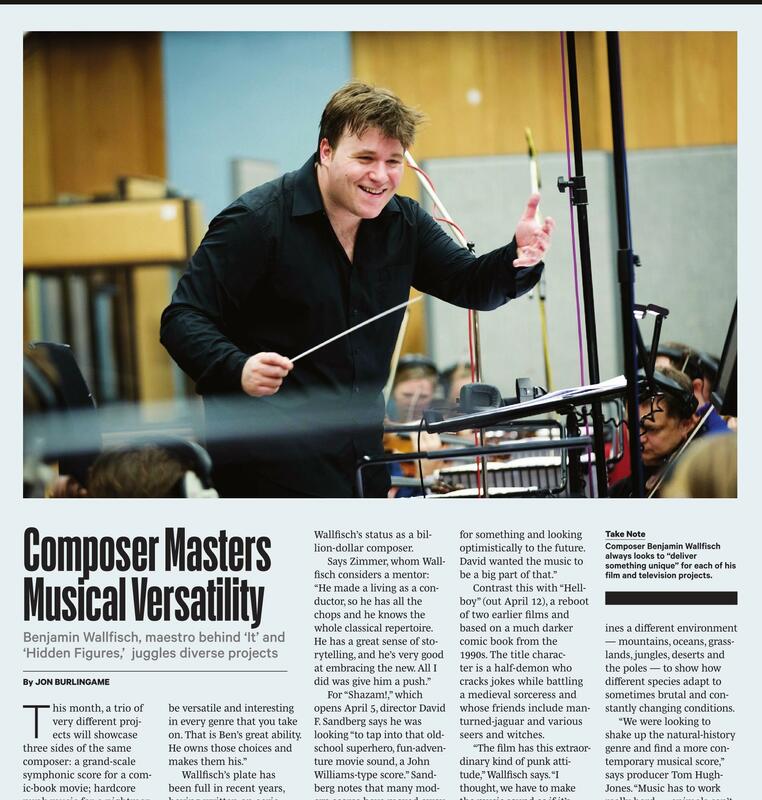 This entry was posted in Composers, Film Music, Interviews, Television Music and tagged Benjamin Wallfisch, Hellboy, Hostile Planet, Shazam!, Variety on April 3, 2019 by Jon Burlingame. His music was an integral part of our young lives, a Christmas tradition in many households — watching Rudolph the Red-Nosed Reindeer, Frosty the Snowman, Santa Claus Is Comin’ to Town and so many other holiday specials: Maury Laws was the unsung musical genius behind them all. As musical director for Rankin-Bass, the animation company that produced all of those shows (not to mention The Hobbit and Wind in the Willows), Laws was responsible for arranging the songs he didn’t write (as in Rudolph) and composing many of the songs in subsequent specials. He even earned a Grammy nomination for The Hobbit. Laws gave few interviews but, in later years, seemed genuinely surprised and grateful for the attention. He died on Thursday in Wisconsin; here is my obituary for Variety. 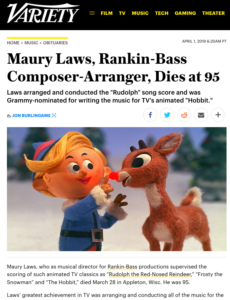 This entry was posted in Composers, Film Music, Obituaries, Television Music and tagged Frosty the Snowman, Maury Laws, Rankin-Bass music, Rudolph the Red-Nosed Reindeer, The Hobbit, Variety, Wind in the Willows on April 1, 2019 by Jon Burlingame. This was long in the making. There were only six episodes of this 1975 TV series starring Brian Keith as Ross Macdonald’s L.A. private eye, but the theme (and pilot score) was by the legendary Jerry Goldsmith — so naturally I audio-recorded one episode for posterity. When the original recording sessions were unearthed 40 years later, I asked to write the notes — and I dug out my old reel-to-reel tape of that forgotten NBC show. Goldsmith was doing a lot of TV in that era (Barnaby Jones, Hawkins, Police Story, etc.) and in fact this was the last hour-long series television episode he would ever score. My notes explore the backstory of the series, why it didn’t last, Goldsmith’s involvement, and a bit about Warning Shot, the 1967 cop drama whose music is also featured on this album. 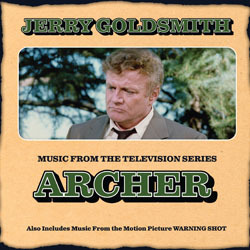 This entry was posted in Composers, Television Music and tagged Archer, Jerry Goldsmith, private eye scores, Ross Macdonald, Ross Macdonald on TV on February 22, 2019 by Jon Burlingame. 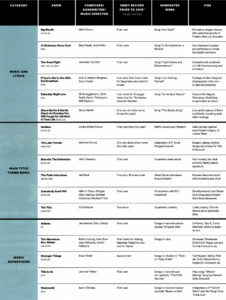 Every December I review the top 20 “classic soundtrack” albums: expanded reissues, first-time releases of great film music of the past, and re-recordings. This year, for the first time, Variety agreed to publish it. 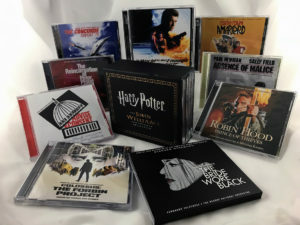 It’s a bounty of great movie music, including four John Williams scores, three by Jerry Goldsmith, more by Dave Grusin and Nino Rota, and two from the new Universal Heritage series. 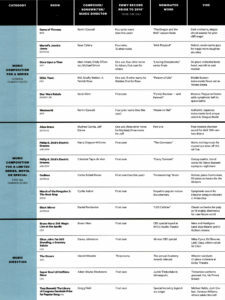 Here is the list, with commentary about each. This entry was posted in Composers, Film Music, Television Music and tagged best of 2018 in film music, classic soundtrack releases, Variety on December 30, 2018 by Jon Burlingame. I get to do a lot of fun things in my job, but the best part is always getting to listen to the music I love, performed live by top musicians in beautiful settings. On Oct. 13, the New West Symphony performed an evening of music by the great Henry Mancini, with guest vocalists Monica Mancini (the composer’s daughter) and Joshua Henry at the Soraya in Northridge, Calif. 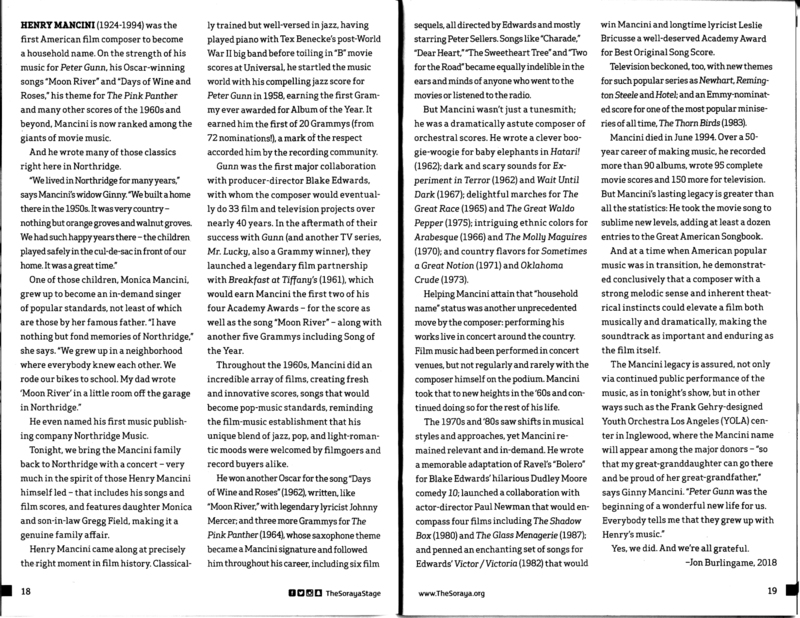 I was asked to pen the program notes for the concert, which included such classics as “Moon River,” “Days of Wine and Roses,” The Pink Panther and such TV themes as Peter Gunn and The Thorn Birds. 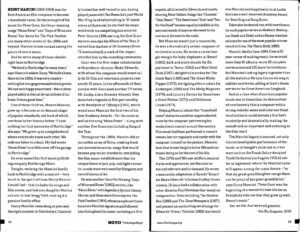 This entry was posted in Composers, Film Music, Television Music and tagged Burlingame program notes, Henry Mancini, Joshua Henry, Monica Mancini, New West Symphony, Soraya on October 14, 2018 by Jon Burlingame. 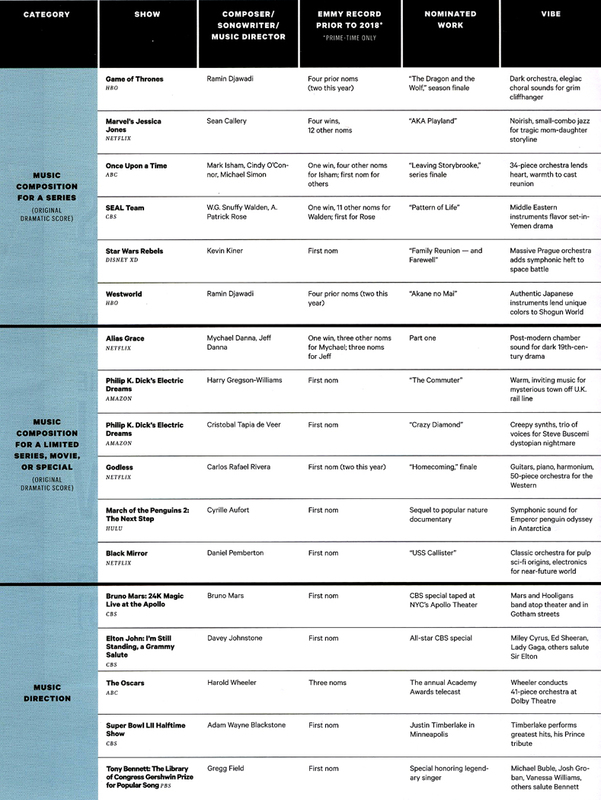 This entry was posted in Composers, Interviews, Television Music and tagged Emmy music, Emmy music nominees, Emmys 2018, Variety on August 21, 2018 by Jon Burlingame. Fans of the Mission: Impossible television series of the 1960s probably know that ABC remade the series (with Peter Graves reprising his famous role of Jim Phelps) in 1988-90. 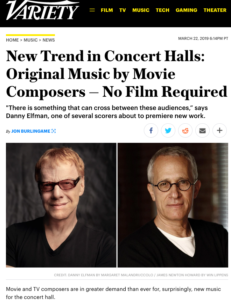 What few seem to remember, however, is that Grammy-winning composer Lalo Schifrin (who created the iconic theme and early scores) returned with three new scores. His then-protege Ron Jones came aboard to write even more music after Schifrin’s departure. 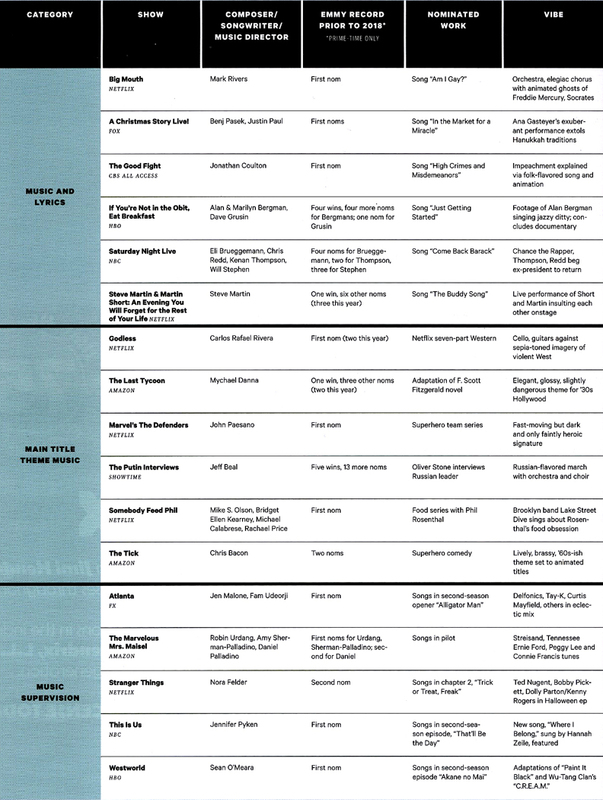 La La Land Records has unearthed those scores and it was a joy for me to revisit this material after so many years. Lalo updated his Mission theme to incorporate synthesizers and a heavier beat — well worth a listen. 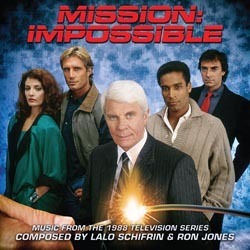 This entry was posted in Composers, Television Music and tagged Lalo Schifrin, Mission Impossible '88, Mission Impossible 1988, Ron Jones on August 3, 2018 by Jon Burlingame.